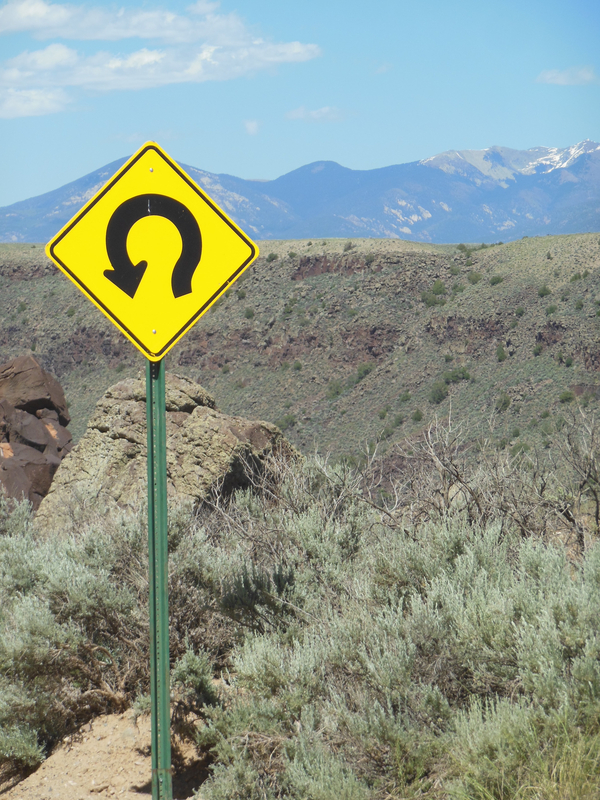 Sometimes the road twists and turns. Following yellow signs instead of way marks. Before setting off on my last minute road trip, the voices of fear gave me a lot of flak for not having planned it in advance, or “enough” in advance. Still, days into my trip, demons continued to berate me (“What the hell are you doing? !” they asked), anxiety held me in its death grip, and I was mystified by the powerful urge to be moving without an itinerary. My rational mind wanted, if not an explanation, at least a framework for what was unfolding. I came up with some (“Road Trip as Awareness Through Movement“, “Road Trip as Etch-a-Sketch“), yet they seemed incomplete. I realized I needed to return, spiritually speaking, to el Camino de Santiago, and its encouragement if not insistence, to privilege the journey over the destination, and find gratitude no matter what. And, I wondered if could integrate my traveler identity into my American persona, narrowing the gap between how I experience myself beyond and within this country’s borders, to feel more like a singular person rather than two. It’s rarely been easy for me to adjust to the United States after a trip abroad. Re-entry is often jarring, and before long habitual behaviors replace the spontaneity and sense of freedom I enjoy in most other countries. Before long, I want to leave again, making me wonder if it’s possible to ever feel free in this land of the free, without having one foot out the door. The older I get, the more pressing this situation becomes. Can I stay happily…or not? When I flew to Spain in the fall of 2012, I did not know in which city, let alone which hostel, I’d spend that first night, or any subsequent night for that matter. After landing in Madrid, I took a bus to Pamplona, boarded another bus to the French border and shared a taxi to the starting point in France, an outcome I could not have planned. That reminded me I would not die if, on the road, I did not have a hotel reservation. On the pilgrimage, I slept in all sorts of places and on all kinds of mattresses. Some beds and bathrooms were more congenial than others but no single sleeping arrangement made or broke the experience, even if in the moment it seemed monumental. Ditto for a road trip: could I accept if not appreciate what was available, wherever I happened to be, without my inner princess and aesthete insisting on matching decor and fluffy towels? The Camino offered opportunities to challenge my notions of comfort and identity. Often, I felt more at ease in shabby albergues hosted by warm people than in cool, contemporary lodging with a chill in the air. Might the same be true in the USA? The more I considered the Camino analogy, the more I realized that maybe my original Camino was somehow incomplete. Despite finishing my trek at Finisterre on the Spanish coast, I hadn’t wanted to leave Europe, but my Pilgrimage-induced leg injury would have made it uncomfortable. My foot dragging, mostly figurative, almost caused me to miss my flight from Madrid. While my leg is improving, it’s not recovered enough to negotiate lengthy strolls along European cobblestones or hike day after day, my two preferred forms of travel. A road trip, with an asphalt rather than gravel path, involves passing through landscapes under a large sky, a Camino on wheels. It was an option I hadn’t ever considered until I suddenly found myself driving from Santa Fe to the Bay Area. Much of my life I had rejected road trips. Sitting in the car for long hours, staying in unremarkable or iffy hotels, and limited food options didn’t thrill me. With my attention focused firmly on Europe, Asia or South America as destinations, I turned my back on this country, not believing it could hold my interest. But since this Jewish gal had already stepped out of a box by walking in the footsteps of millions of Pilgrims, why not motor along the paths paved by Native Americans and pioneers? Could I bring the same curiosity and loving eye towards the landscapes and towns of the United States as I did to the vineyards, farms and villages of Spain? Could I appreciate our “purple mountains majesty” and “amber waves of grain”, too, or would I see them through the lens of earlier beliefs, that by virtue of being in this country they were somehow less exciting? To mirror my Camino experience of beginning each day not knowing where I’d end up that evening, I made a rule: I would decide where to spend each night no earlier than that same afternoon, unless I hoped to stay with a friend (they got a few days’ notice). With Priceline and AirBnB on my iPhone, I could check proximity, availability and prices without having to call or drive around. Limiting myself to these tools meant accepting what I found, much as I did on the Camino. Often, in Spain, there were few options of where to stay, especially if I couldn’t walk another step. Occasionally the albergues assigned beds, removing all choice, requiring me to accommodate the accommodations, no matter how much they diverged from my imagined ideal.